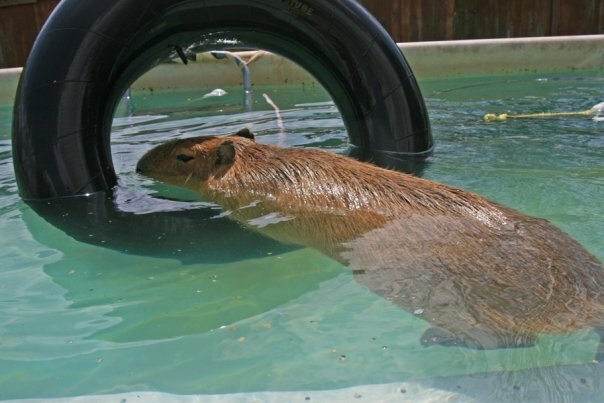 If you are a capybara lover, as you must be if you are reading this blog, then you know there is almost nothing out there to satisfy your desire to display your dedication to this fantastic creature. I am trying to solve this problem for you and for me. 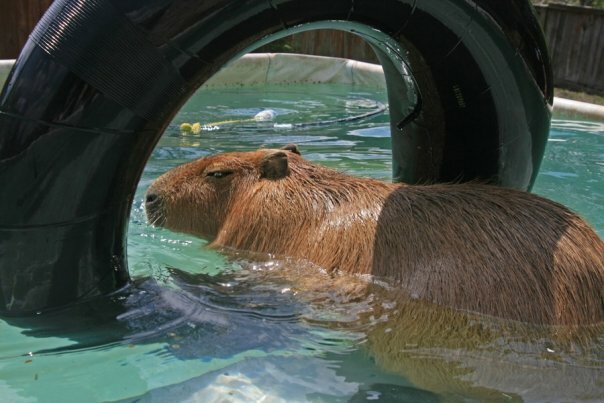 Recently, I thought how nice it would be to have a capybara beach towel. 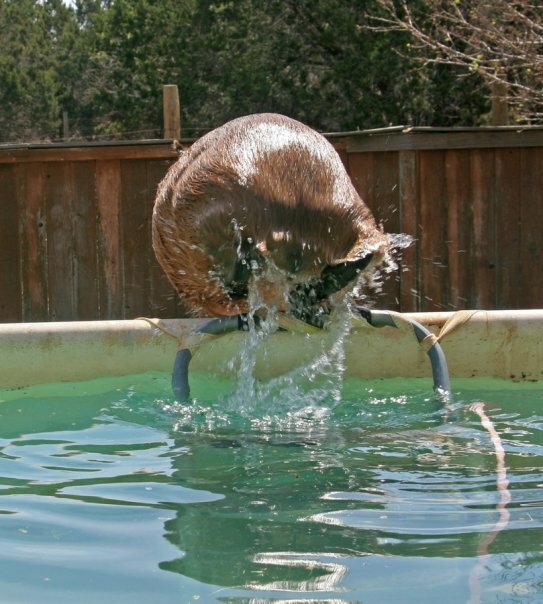 I’d like to get out of the pool after swimming with Garibaldi and dry off in such a towel. But it’s never that easy. First I had to find a place that would make towels with custom images. Then I had to figure out if they could be made at a reasonable price. Then I had to decide what images might look nice on the towel. Lastly, since I have to buy at least 50 towels, I need to know if anyone would actually be interested in buying one. That’s where I need your help. I picked out the two designs above because it is much less expensive to do a tone-on-tone print. The towel would be 100% cotton, velour/terrycloth, 30″ x 60″. Towel color is yet to be determined but all towels will be one color. The cost would be $25 US plus shipping. Please take the poll on the right side bar and let me know what you think. Comments are also appreciated. 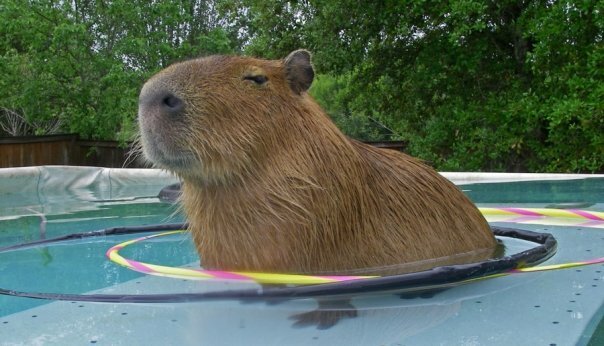 I would buy two towels and I like blue with the super capy..would make great gifts. Both are very nice – would buy either one. Love the idea! I like both, it’s hard to pick. $25 is reasonable for a beach towel. I think this is a fabulous idea, I would buy one for sure!! 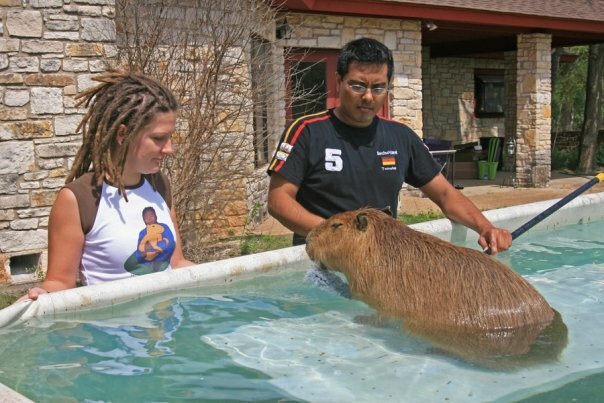 I WOULD BUY MILLIONS PLASE MAKE THEM I LOVE CAPYBARAS PLEASE DO THEM!!! But if u could do a blue addition of the red one that would be awesome! 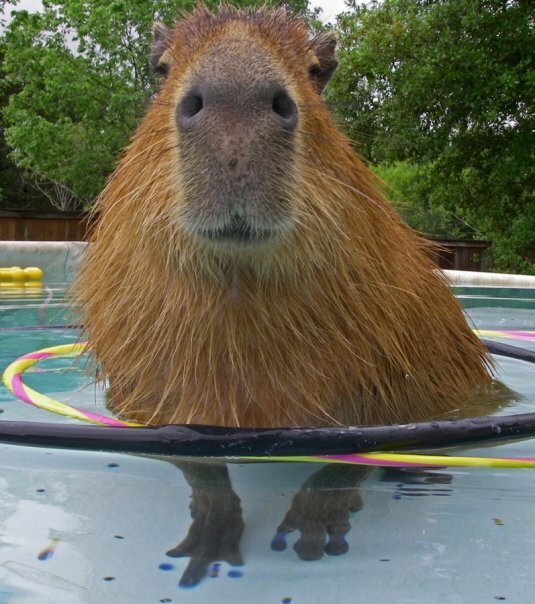 CAPYBARAS RULE!!! After showing my enthusiasm on Facebook I am sadly disappointed with these designs. I thought they were going to be with a photo of Gari on. For my tastes they look too commercial, especially the top one – reminds me of the white products with red heart that say “I love (whatever here)”. I would rather pay more to have an actual photo. Sorry to be so negative but I have to be honest. I love the idea and love both of the color choices — YAY!!! !they are not white. I prefer the graphic shown on the blue one but would buy the red one if it’s the one that gets chosen. I can definitely commit to buying at least one and maybe a second! The price for what you’ve described sounds very reasonable. Thanks for looking into this — sure hope it happens! 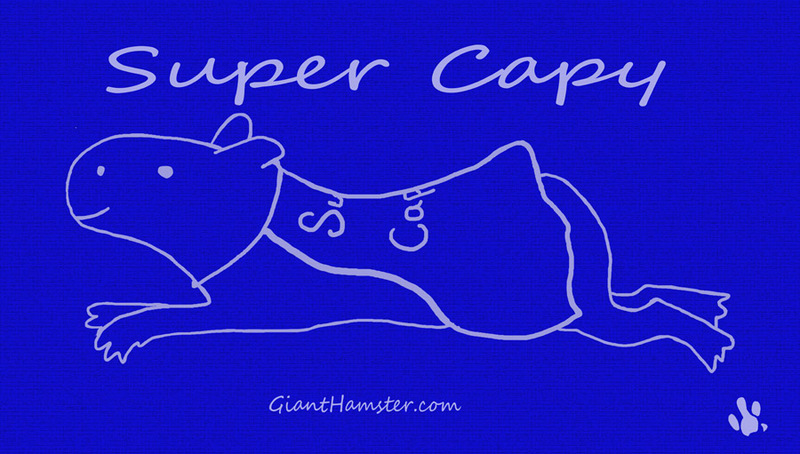 I like the blue one with the Super Capy. The hand-drawn design is just a little more unique. Too bad you couldn’t do stripey, because that would be the bomb, but I get how printing costs could get out of hand quick. I would definitely get one, both to help you guys out and also because NO one else would have one around here! 😉 Love to you and Garibear. Would buy either of these but especially love the top one (perhaps in a different colour) good price though and great idea. I like both designs a lot! I’d want either. 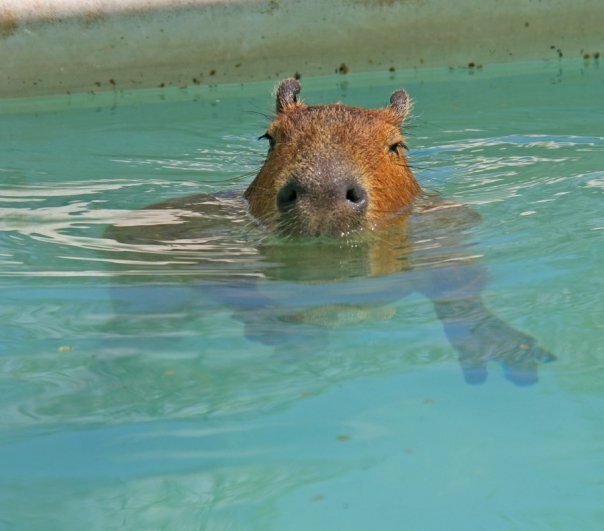 The price is a bit steep, but if I had the disposable income, I’d probably go for it, just to have a cute capy towel to take out and about. I love this, I would totally buy either but the red “I heart Capybaras” is the best!! I love them, and will buy at least one of each design, can’t wait!!! The towels are great. 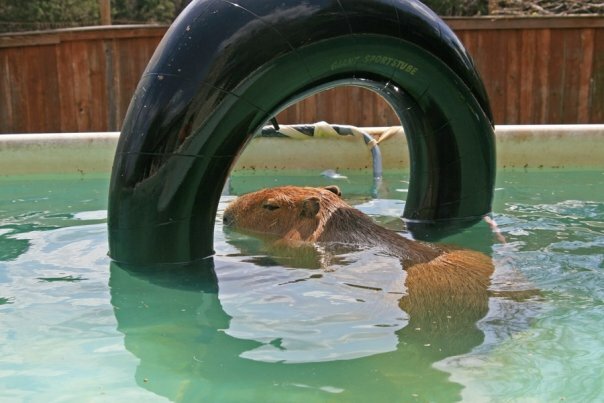 How about towels woth Super Capy on one side and I <3 Capybaras on the other? Question: are the images screen-printed on? I can’t get a design on both sides. It isn’t screen printed. It’s actually a texture difference in the cloth. I got a sample towel, which is nice, but I think I have to modify the design to make it stand out more. Still considering whether to do this or not. I decided to wait until next spring to have them made. It got too late in the season this year before I was ready to do anything. So look for them around April!